It feels as if The Settlers of Catan has been around forever. It's an absolute giant of the gaming world, with a huge variety of expansions and spinoffs, which we'll cover in detail later. In fact, Catan is less than twenty years old, having been created in 1995 by German game designer Klaus Teuber. So, the first and most obvious question: What is Catan? Well, it's a name, and it's the name of an island. This island is what you're going to spend much of the rest of your life obsessing about, because Catan is one of those games that keeps wanting you to come back for more. At the start of the game, the island of Catan is completely deserted. It's a land ripe for colonisation, and it has a wide variety of terrain to plunder. As you might expect, the desert is an unfriendly place, and there's nothing worth having there, but every other form of terrain generates resources for you. The hills get you brick, pasture naturally leads to wool, mountains produce ore, the fields lead to grain, and the forest grants you access to lumber. These are the five basic resources in the game. What you do with those basic resources is up to you, but there are a few basic options. In order to win the game you need ten Victory Points, and these come from a variety of sources. Settlements require brick, lumber, wool, and grain, and are worth 1 VP. Go further up the chain, and you have a city, which needs lots of ore and grain. Roads link your holdings and give you the chance to get the 2 points for the Longest Road, while development cards give you extra possibilities. Knight cards help you towards having the Largest Army on the island, which is worth 2 points, while Progress cards help you on your way - think of these as beneficial chance cards from Monopoly. Then there are Victory Point cards, which cut straight to the chase and take you towards the winning line. 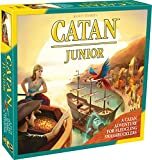 Whatever you decide to purchase each turn, you'll need those precious resources, and the way that you get them is central to the whole Catan brand. Each hex on the board - and the hexes get distributed randomly every time you play, making for a unique strategic challenge each time - has a number between 2 and 12. Every turn the two dice are rolled, and whatever hexes match the number rolled produce their resource for all players who have a settlement there. This is key, because it means the dynamics between the players are shifting every turn, since you don't sit there waiting for your opponents to do their own thing while your strategy remains static. It's not uncommon for all the players to get some kind of resource every turn, but working out what to do with them is a big deal, 'deal' being the operative word. This is an island, remember, and resources are scarce. You're certainly not going to have roads and settlements all over the map, and however hard you try there are going to be certain resources that you just can't get access to by yourself. That brings us to trading, and it's one of the key components of the game. 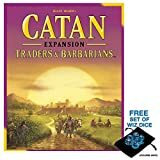 If you like to barter, if you like to cut a deal, if you like to imply that you're after one thing when you're really valuing something else, you'll love Catan. You may have brick, wool, and lumber, but without grain you won't be building any more settlements. Sure, you have access to grain if the dice ever come up with a 3 or an 11, but that's pretty unlikely (only 1 in 9, as it happens). Realistically, you need to go cap in hand to one of your opponents and offer them some of your excess wool, or brick, or...The trouble is, they know full well what you're missing, and can see just as well as you can that you're struggling for what they've got. Hopefully, you've got them over a barrel too, and can make a reasonable trade. In fact, reasonable trades happen a lot, because in a big game two players both generating a positive move forward through a trade are well ahead of the others who refuse to bargain. Like many games, Catan has the dynamic of starting slowly and getting more and more powerful as the game progresses. Making those early steps in a timely fashion is really important. However the board has been set up, there's ultimately not enough room and not enough resources and not enough time to achieve everything you want. It's compromise, compromise, compromise, and your plans are going to have to be very flexible if you want to win consistently. Although the dice are rolled every turn, there's a huge dollop of skill in every game. Speaking of dice, it's fairly basic probability that some numbers come up more than others, and no number comes up more often than 7 (because it can be made 6 different ways from the two dice). Unfortunately, no hexes have the number 7. Instead, rolling a 7 brings the Robber into play, who unsurprisingly redistributes some of the resource balance a la Robin Hood. So, the game in a nutshell: build roads to link to new settlements, get resources from your newly-settled lands, trade with other players for the resources you need to build more settlements or cities, and get to ten Victory Points first to win the game. Sounds simple, doesn't it? That's part of the charm of Catan. The rules for the game fit comrotably on four pages. You don't spend an hour setting up the board, nobody reminds you of a rule you'd forgotten four hours into the game that completely invalidates your strategy. Instead, you're playing within five minutes, and the whole game is done in about an hour, even with four players. Speaking of players, it's worth thinking about how many you're going to want to play the game with. It's technically possible to play with two players, but with only a single opponent to trade with, it can quickly degenerate into a game of 'I'm ahead, so I'll say no to your every trade proposal'. The base set supports games for up to four players, with expansions giving you additional pieces, taking you up to five or six players.